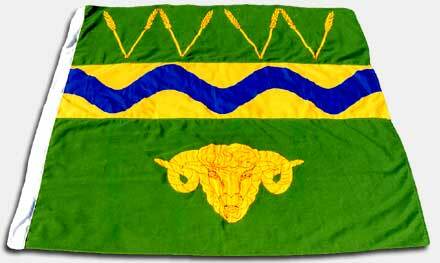 In 1965 Council adopted a City Flag, at the time it negotiated a "Coat of Arms" through the College of Arms in London. The flag was designed by Mr H Ellis Tomlinson, MA, FHS. The stalks of wheat and other motifs incorporated in the design were suggested by Council. The design of the city flag was taken from the central motif of the shield of the Coat of Arms, with the design being made square.